CM Fusion is an all-in-one cloud-based project management platform that keeps construction teams better connected. Work smarter and reduce costs. Manage everything in one place. 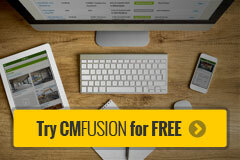 CM Fusion is a hub for all your project information – documents, images, team members, field reports and more. Our cloud platform is accessible and optimized for any device with an internet connection, offering construction teams real-time access to project files and data from anywhere, anytime. Stay better connected.